Bigger is not always better. My Arc’teryx backpack was a true expedition-quality pack and with a capacity of 95 liters could carry damned near anything. It’s the pack you want when you’re climbing Everest. Or when you’re in your twenties and a lot more confident of your own strength than you are now. I knew my Arc’teryx Bora Backpack was too big before first leaving town three years ago but it was high-quality, had already been around the world once and –most importantly– was already paid for. And it has served me well, but I was tired of struggling with the size and the weight and realized that just by downsizing to a smaller, less-manly pack I could cut 3 pounds or more from my total load. And I’d have less free space to fill with junk. So I picked up a 70 liter Osprey Aether Backpack on sale at REI and am very happy with it so far. The quality of construction is considerable less than my old pack but the load on my back and shoulders is noticeably less. I also grabbed an airport pack cover which will be handy when checking my bag and double as a rain cover. The next heavy item to go was my leather boots — they looked great and I really appreciated them in cold, wet weather but mostly they were a four-pound, size-12 brick in my backpack. I replaced them with a pair of waterproof Teva trailshoes — $140 at REI but I found last year’s model online for $80. They’re half the weight and take up about 1/3 less space. I bought most of the big stuff at REI but made an effort to keep prices down (and was lucky enough to be shopping during the holidays’ sale season). By the time I was finished, I’d managed to buy almost $700 worth of gear for just under $400 by catching sales items, taking advantage of rebate offers and shopping in the store, then buying online. I avoided buying clothes and assorted stuff sacks, etc at the premium shops and picked these up at Walmart, sporting goods stores, Old Navy and such. I don’t mind paying for quality gear but there’s no sense paying double for a pair of cargo pants. All in all I think I shaved about 6-7 pounds off my old pack weight and can tell a huge difference when I put the pack on. 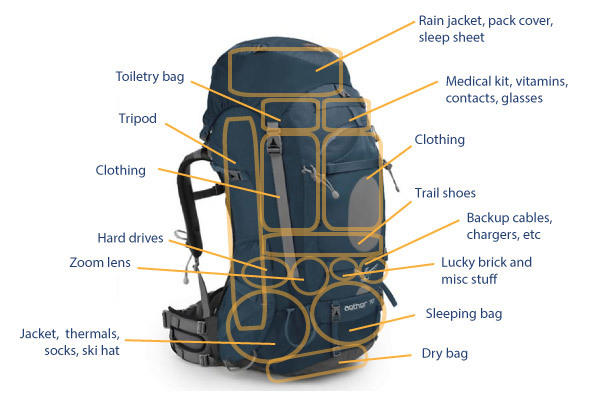 What follows is my full gear list (for those contemplating their own long-term trips) and a graphic showing how I pack. Too much? Or am I missing something? I’d love to hear your thoughts. I’ve been wondering for those who travel for a long time, obviously there are seasons to go through. I’m about to embark on my journey, I’m wondering should I pack for summer and winter? Do you do that and if you do how to carry it all? Because I wonder, if I’m staying in a place for the summer but in the winter it gets a lot of snow, should I bring my snow shoes? It’s hard to say without knowing your plans. If there is a piece of gear that I think I’ll only need for a week or 2 in a long term trip, I’ll probably leave it behind depending on weight and bulk. I carry a sleeping bag but only because it weighs a pound and a half and is about the size of a cantaloupe. When I needed it, I REALLY needed it and I think it has been worth lugging around. Laura, I’ve been traveling the last 6 months around the US from Southern States like Tennessee and Texas to colder areas like North Dakota and Minneapolis. I tend to travel with layers and clothes that can mix/match. For example; a lot of my wardrobe is comprised of skirts that can be paired with thick/warm tights and boots for colder weather or bare-leg with sandals for warmer weather. The same with my shirts. I carry two long sleeved shirts that can be layered under my cooler summer shirts. A fleece and down coat (that compresses to almost nothing and weighs even less). My pack is only 32 liters so I have to optimize the space. JV has a good point that you can purchase any additional gear that you need along the way…and it really does depend on your travel plans. I think you’re going to be disappointed in the O-70. I have one after doing tons of research, and what stinks about it for long term travel is the lack of compartments. You only have the brain, and the bottom, everything else is together. So unless you are color coordinating your sinch sacks, everything will generally fall to the bottom of the main pack. There isn’t a laptop compartment, and if you keep anything in the sleeping bag area without padding, it’s going to get beat up. Good luck with it, but for long term travel, there are much better options. For backpacking for a week, it’s awesome, as the brain detaches to be a fanny pack for day hikes, and it doesn’t matter what you look like in the wilderness. Looks like you’re ready to GO! Kudos Wes. Btw, get on the list for REI’s ‘garage sale’ – you’ll save a ridiculous amount during those events. Keen sandals are the best! What’s the total weight you’re carrying around? The MacBook Pro has got to be about 5 lbs. alone! These guides are so informative. We sent some link love your way here: http://www.frugalmonkey.com/travel-news/web-wrap-12-february-2013.html. Thanks for the interesting read! Earl – awesome gear guide mate love it! It really can get quite heavy adding up all the equipment, especially those technology Items, but there so essential. How heavy do you find the 70ltr pack? I was considering a 85ltr as I am away for a extensive period mostly (over a year), probably the best Idea even though the weight will be quite a burden. Your right, that space will end up getting filled with useless luggage. The 70Ltr seems to be the go, thanks so much for your help, greatly appreciated. Unless i do the Annapurna Treck or something i do not carry a back pack any more. I had simple duffle bags that are lighter and easy to store as they come without the sholder straps and what not. The last year i had trolleys and i am really happy with that all over SEA. Never mind how heavy they are – you have wheels and that is great. And when do you really really walk off road for a long time and would need the bag pack?? I use the handle and it works like an bag pack (for a short time – than it starts to hurt) good enough to get me to my bungalow in the rice fields. Lets face it – most of us tend to take the bus or taxi to the airport and do not walk in the jungle and most of the trips are on more or less paved roads anyhow. And from the mini bus to the boat you can carry the trolley like a duffle bag – no problem! And yes – the last 30 years i did find out the hard way – the bigger the bag the more you will pack! Keep it small and travel light!